I spent some time researching an easy but delicious dough. I also looked at different vegetarian filling options for empanadas. I found an easy dough recipe, and I made some lower calorie adjustments to it. Since I have never made empanadas, I was slightly worried since they seemed like a lot of work. However, these were actually quite easy! The dough comes together quickly with the help of a food processor. I actually made up the filling recipe as I went, but it was easy to make. There is a ton of customization in the filling, so feel free to experiment with your own favorite vegetables. Don’t get scared off by the ingredients and steps. 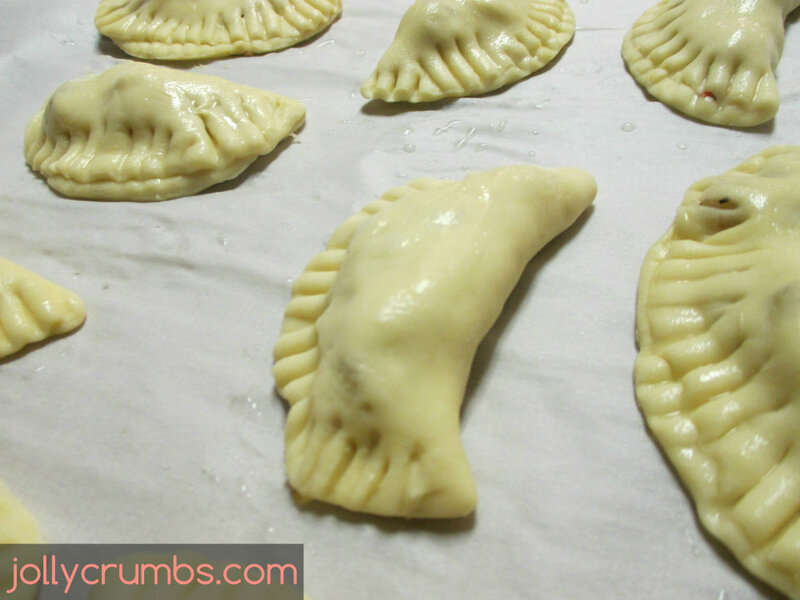 This is really quite easy since you make the dough and filling separately and then fill the empanadas. We will start with the dough first. Place the flour and salt into the bowl of a food processor. Pulse a couple of times to blend. Add in the cold lite margarine and pulse a few times until the mixture looks crumbly. Whisk together the egg, water, and vinegar in a small bowl with a fork. Add the egg mixture to the flour and pulse a few times until a dough begins to form. Remove the dough from the food processor and shape into a flat disk. Wrap the disk in plastic wrap and chill in the refrigerator for an hour. Making the dough took about 5 minutes, if that. Very quick and easy! Next, we will make the filling. Spray a large skillet with nonstick spray, or coat it with about 2 tablespoons of oil. Heat the skillet over medium high heat. Add the potato and cook until the potatoes are soft and golden brown on the outside. Add the onion and pepper. Cook until they are soft, which was about 4 minutes for me. Add the garlic and cook for about 5 more minutes. Add in the salt, pepper, and cumin. Stir until everything is well combined and cook for one more minute. Remove and set aside. You can use any vegetables you would like. Just make sure anything you use is cooked all the way through before you assemble the empanadas. Now for the empanada assembly. Preheat the oven to 400°F. Line a baking sheet with parchment paper or a silicone baking mat. Depending on the size of your pan and how many empanadas you make, you may need a couple pans or make a couple batches of empanandas. 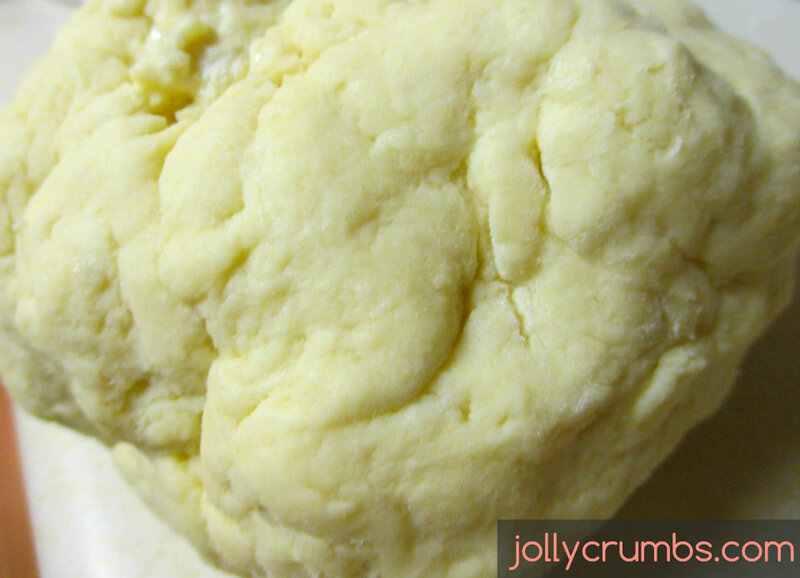 Remove the dough from the refrigerator, and let it sit at room temperature for 5 minutes. Whisk together the egg whites and water for the egg wash. Lightly flour a work surface. Roll the dough out as thin as you can, about 1/8 of an inch thick. Make sure you flour your rolling pin or the dough will stick. Cut out circles of dough with either a 4 inch round cutter or use the rim of a drinking glass. I used a glass and it worked perfectly fine. Place the cut dough on the prepared baking sheet. Place a tablespoon of filling on one half of each circle. Brush the egg wash on the empty side of the circle. Fold the dough over to make a half circle. 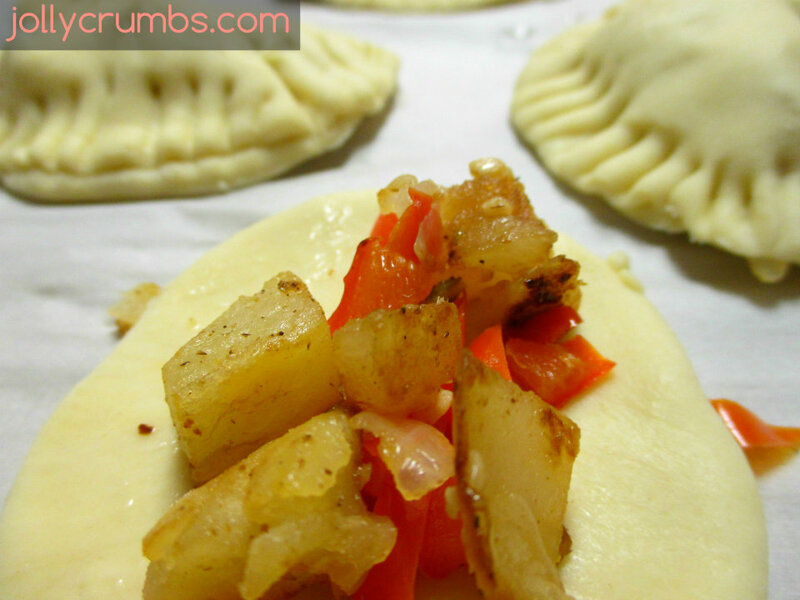 Close the edges, then crimp the edges with a fork so the empanada is completely sealed. Brush the tops of the empanadas with the egg wash. Bake for 10 minutes. Flip the empanadas over, brush again with egg wash, and bake another 10 minutes, or until golden brown on both sides. Cool for ten minutes on a cooling rack before serving. These empanadas are delicious! I couldn’t believe how easy they were to put together as well. You can also make the dough ahead of time and keep it in the refrigerator. 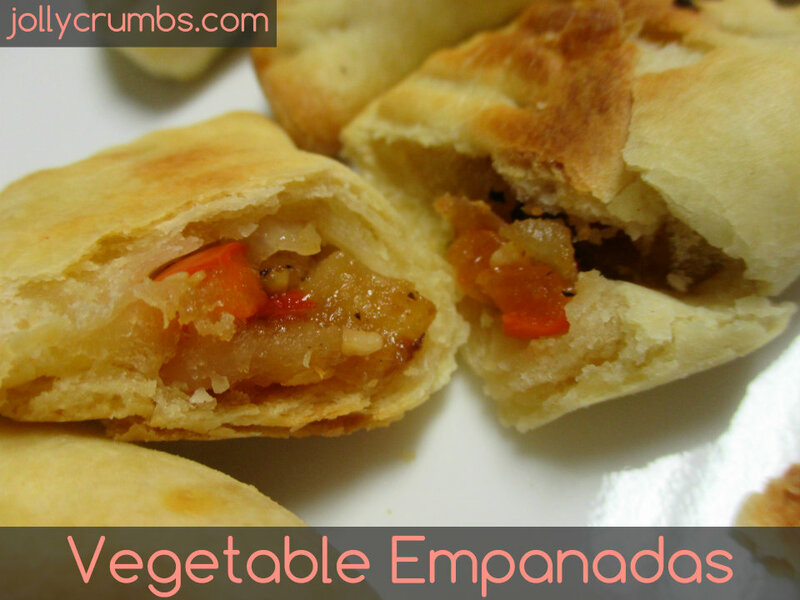 This recipe also makes quite a few empanadas, so they are perfect for leftovers or sharing. The dough is flaky and light. The filling is flavorful and a wonderful contrast to the flaky pastry. You can use anything you’d like in the filling, which makes these perfect for anyone. You could add cooked meat, other vegetables, sauces, or cheese to these. You could also add a little sugar to the dough and fill these with fruit for dessert. 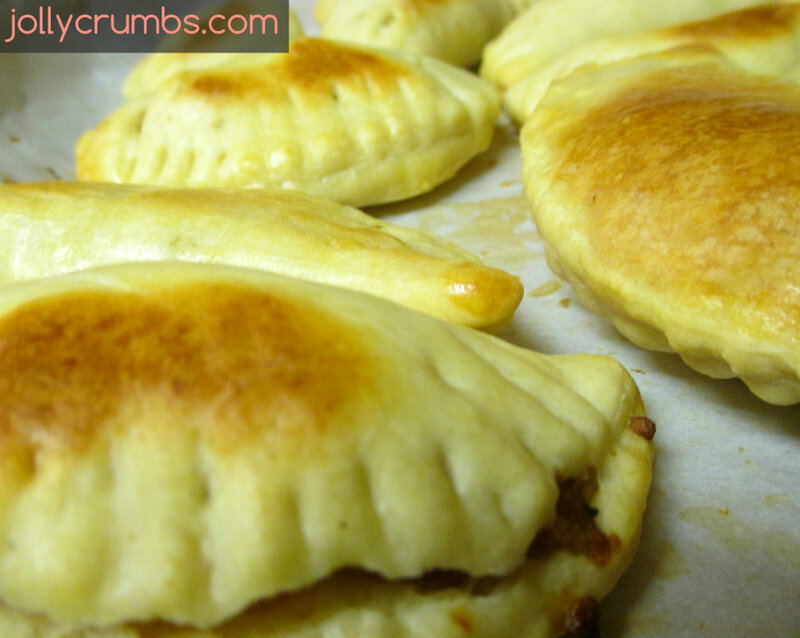 The possibilities are endless for these empanadas! This is definitely a repeating recipe in our house. Place the flour and salt into the bowl of a food processor. Pulse a couple times to blend. Add the cold margarine and pulse a few times until the mixture looks crumbly. Whisk together the egg, water, and vinegar in a small bowl with a fork. Add to the flour mixture and pulse a few times until the dough begins to form. Remove the dough from the food processor and shape into a flat disk. Wrap it in plastic and chill in the refrigerator for an hour. Spray a large skillet with nonstick spray or coat with 2 tbsp oil. Heat over medium high. Add the potato and cook until the potatoes are soft and golden brown. 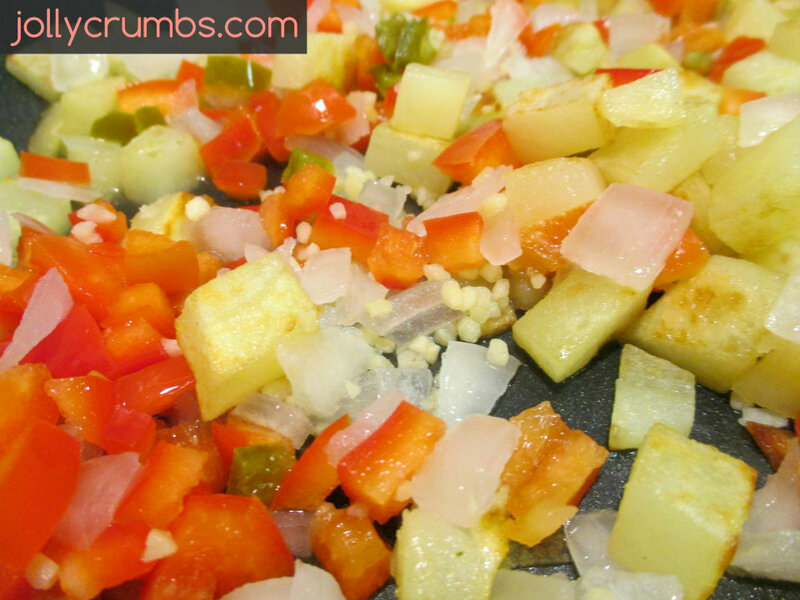 Add in the onion and pepper and cook for about 4 minutes, or until the vegetables are soft. Add in the garlic and cook about 5 more minutes. Add salt, pepper, and cumin. Stir and cook for one more minute. Remove from the heat and set aside. Whisk together the liquid egg whites and water. Preheat oven to 400°F. Line a large baking sheet with parchment paper or a silicone baking mat. Remove the dough from the refrigerator and allow it to rest at room temperature for 5 minutes. Lightly flour a surface. Roll out the dough with a floured rolling pin. Roll out the dough to about an 1/8 of an inch, or as thin as your can roll it. Cut out circles in the dough either with a 4 inch round cutter or the rim of a glass. You can re-roll any scraps. Place the cut out dough on the prepared baking sheet. Place a tablespoon of filling on one half of each circle. Leave a ½ inch border. Brush the egg wash on the empty side of the circle. 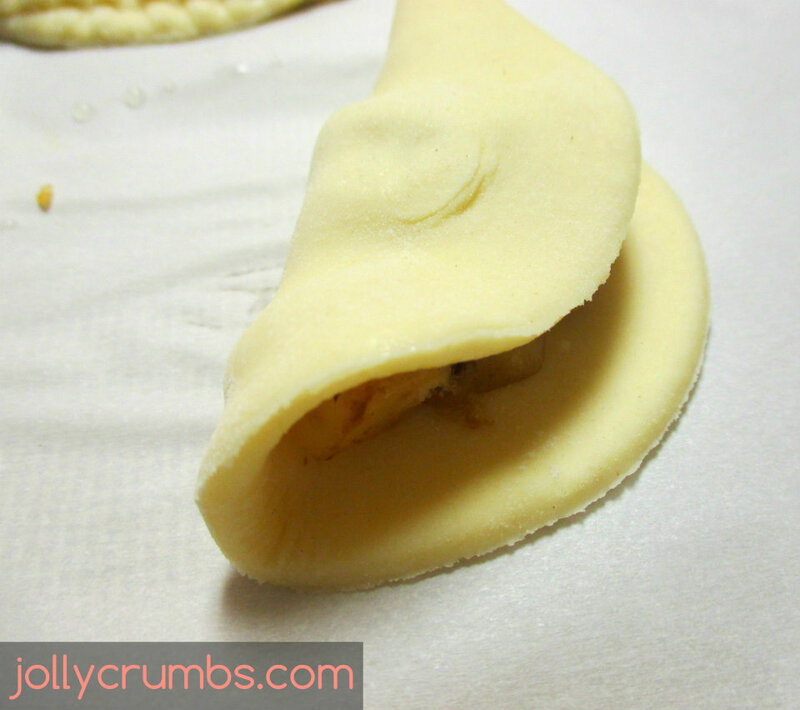 Fold the dough over to make a half circle. Close the edges, then crimp edges with a fork. Brush the tops with egg wash. Bake for 10 minutes, flip the empanadas over, brush again with egg wash, and bake another 10 minutes, or until lightly golden brown on both sides. Cool ten minutes on a cooling rack before serving. I placed my margarine in the freezer after I cut it into smaller cubes. The lite margarine I use is slightly softer, so freezing it allowed it to be as firm as regular butter. If you are using regular butter, no need to freeze it. Softer butters may need to go into the freezer for a bit so they firm up. You can use any vegetables and spices you’d like to in the filling. Mushrooms were originally called for in this recipe, but I’m not a fan. So feel free to add in any vegetables you love in this recipe! Wow girl, you have been busy posting the recipes this week while I have been slacking off! They all look so great. 🙂 You go! Well another who doesn't get it because they've been influence by myths and a skewed sense of perception probably due to media influences. Beauty is not something which is finite and comes and goes. It is. Beauty exists. It's like looking at a tree with various colorings of falling leaves and commenting that it must have been a beautiful tree before the fall. There are stages in life and in nature: why not so in life and humans? See what we have to overcome…Ari you are probably one of the few people who get it! No deja de ser curioso, porque creo que la matrÃ­cula de Wittgenstein la obtuviste con un trabajo sobre el Tractatus, y no sobre las Investigaciones FilosÃ³ficas, que tienen muchos mÃ¡s puntos de contacto con el de la otra matrÃ­cula, Saussure.